There are only six active wing walkers in the country. One of them is Ashley Battles. 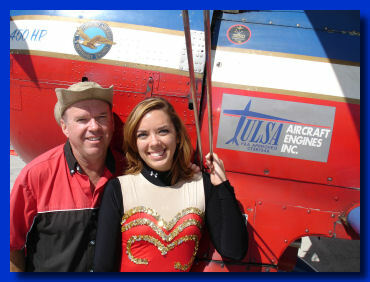 She’s been flying since she was a teenager and graduated from OSU with a degree in aviation. She could fly most general aviation airplanes. Instead, she climbs on top of them. “I knew I wanted to be a pilot for the rest of my life, but after getting all of my ratings, I was really kind of bored with flying straight and level,” she said. But will she get bored walking on a wing for five hours? She’s pictured below with Greg Shelton. Ashley Battles is going for a really long walk on a very short path. She is preparing to take a five-hour stroll on the wings of a 450 Stearman piloted by Robert Ragozzino…The current wingwalking record is 3 hours, 39 minutes; however Battles and Ragozzino are shooting for five hours. 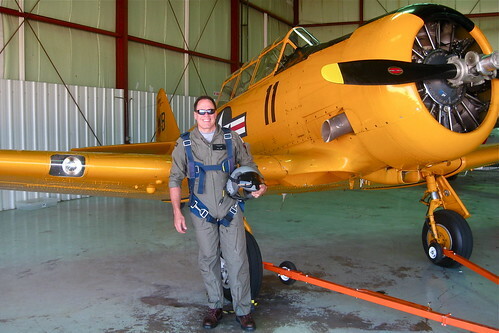 Of course it’s to set a record, but Ragozzino hopes to call attention to his future plans to recreate Lindbergh’s flight in a replica of Lindberg’s “Ryan” aircraft. I’ve weighed in on this before and while I admire their effort, courage and stamina, I seems like it’s a wild stunt that won’t necessarily promote general aviation. Will more people be attracted to flying or think it’s strange? How many light airplane pilots have relatives and friends that already wonder why we take to the air? Five hours is a long time inside a plane. This entry was posted in Aerobatics, General Aviation. Bookmark the permalink.